A project where personal life can get along in perfect harmony with the professional side, connected but in the same time separated, maintaining the intimacy and privacy of the family environment. A special house designed by artists for artists, in a perfect match. A long road of working togheter with pleasure and satisfaction of having the best client as any architect would desire to have. The story of the project was very clear from the beginning, as the client, a very creative person, one of the most famous tattoo artists in Romania, the owner of Poly Tattoo Shop, a visionary and decided personality expressed the necessities of his everyday life. A multifunctional building divided into tattoo shop and residential area, so he could relocate his business efficiently next to the place where he will move with his future family. – a front unit for the shop like a matte screen, with no front windows, where all the necessary functions for his business could be incorporated: reception with waiting area, exhibition area for his artwork, a kitchen for his clients, toilet room, 4 rooms for the tattoo artists, a separated piercing room, a smoking outdoor spot and a guest bedroom with dressing and private toilet specially conceived for guest tattoo artists from all over the world. – a back unit where he will stay with his family, totally separated from the shop, but in the same time hidden from the curios eyes of the customers that will pass the doors of his shop everyday; the connection between the two volumes had to be organized via exterior lane, specially conceived to induce a psychological feeling that the client leaves his job and goes home, in a total different place. 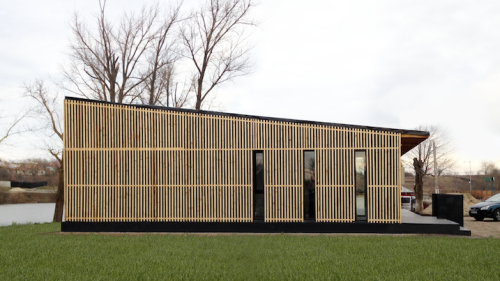 Poly House & Tattoo shop is described by minimalist architectural elements. This imposing property is constructed with a totally black façade, as a ‘sober and rational construction’ based on the client’s desires to own a house with considerable character. 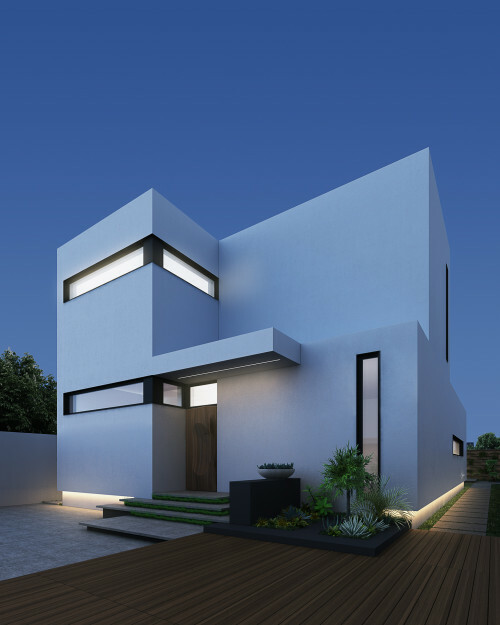 Situated in a desirable residential area the exciting sleek black silhouette of the minimalist house architecture makes a bold statement. Openings are cut into the main volume of the house allowing light to flood into the interior. Spaces are created for patios and sun terraces to allow the occupants maximum opportunities to relax and entertain outdoors. The whole of the south facing side is devoted to providing space for leisure activities. The general concept present two units connected by a glass bridge, beneath which stands a small private pool surrounded by a spacious decked area and an outdoor dining place for its clients. The glass bridge was designed specifically to connect the owner’s tattoo room to his masterbedroom, in the situations when he is very tired and not in the mood to bypass around the tattoo shop to enter his home, or for the situations when the snowy winter season is not so friendly with temperatures beyond minus degrees. 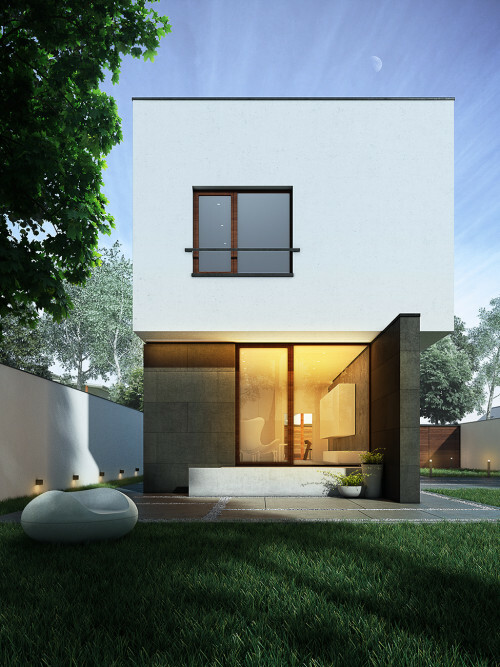 Constructed over two floors the minimalist architecture house is spacious with simply configured rooms. These are all based on volumetric unadorned geometry. Floor to ceiling windows allow for a direct connection with exterior spaces so unity is created between inside and outside living areas. 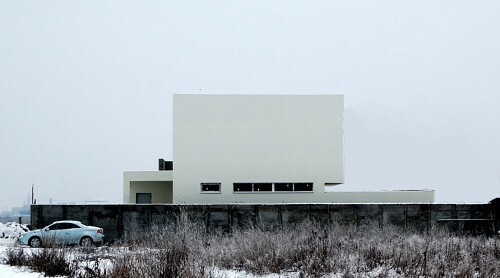 The minimalist architecture house is white throughout the interior. The unadorned white walls and surfaces are uniformly complemented by warm timber flooring, Here a glossy black floor continues the stylish theme of black and white contrasts. Noticeably even the doors are totally plain, without sticking out handles to break up the simple design scheme. 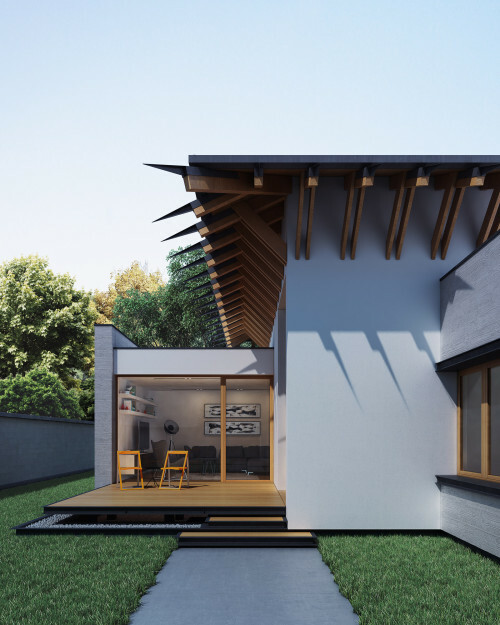 Right through this minimalist architecture house there is more than a passing reference to the harmonious appeal of Japanese house architecture. The system of inter related rectangular shapes and forms is a perfectly balanced correlation of black and wood contrasts with subtle notes of rusty metal, a perfect blank canvas that waited to be personalized. The functional solution was a direct answer on how to solve both professional and personal environment while keeping different levels of privacy for the latter. 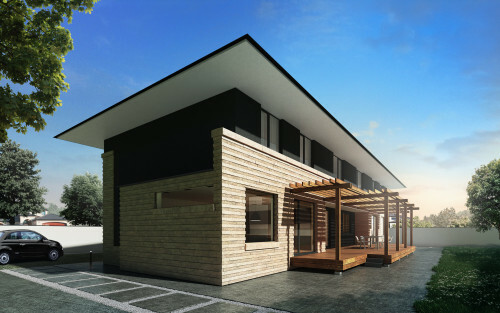 Therefore, a variety of spaces and a specifically minimalist façade were designed to protect the family privacy in relation to the front (the tattoo shop), with a few strategically-placed windows that face the reception area of the clients. An open-plan living room dominates the ground floor, with two bedrooms and a hallway occupying the rest of the space. A staircase connects the entrance hall to the second floor of the house, which protrudes toward the front road. While narrow windows provide an optimal level of privacy, a skylight located above the masterbedroom brings in additional light and compensates for the lack of facade openings.